TOKYO CHRONOS 2nd PV, featuring opening song "UNLIMITED" Unveiled! I am Kishigami, the executive producer of TOKYO CHRONOS. I sincerely appreciate everyone's support thus far on TOKYO CHRONOS. Today I am pleased to make a very special announcement to everyone. That we are not only pleased to show off the 2nd PV for TOKYO CHRONOS as well as the 2nd key visual for the game, we are also announcing that the opening song for TOKYO CHRONOS will be sung by none other than Eir Aoi!!!!!!!!!! Yes, we're talking about that Eir Aoi who's famous for her work on songs from "Sword Art Online", "Fate/Zero" and so forth!!!!! This was all made possible from the many people who supported our crowdfunding efforts and from the efforts of Producer Kazuma Miki!!!!! And regarding this announcement, I have a request for all your production accomplices. And that is to spread this PV to fellow accomplices far and wide! 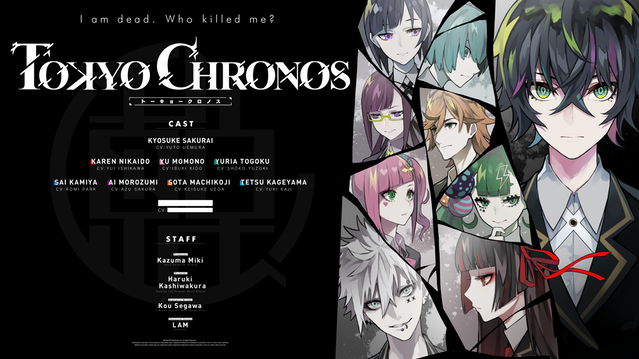 With Eir Aoi singing the opening song, this is a big chance to spread the word about TOKYO CHRONOS!! Fellow accomplices, please lend us your strength and support! With everyone's help, we will be able to promote TOKYO CHRONOS further and farther throughout the world! I sincerely appreciate everyone's help in this effort...! For now, I would be grateful if everyone can enjoy Aoi Eir's new song "UNLIMITED" as well as this new PV for TOKYO CHRONOS! We look forward to your continued support of TOKYO CHRONOS!